This hands-on program for teaching students with autism will help you develop effective strategies for teaching children with severe communication and social interaction difficulties. 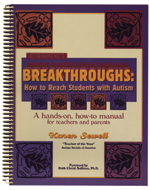 Activities are included for teaching language, reading, math, social/adaptive behaviors, and other skills. Over 200 pages of practical, easy-to-use materials that will save you time in program planning.